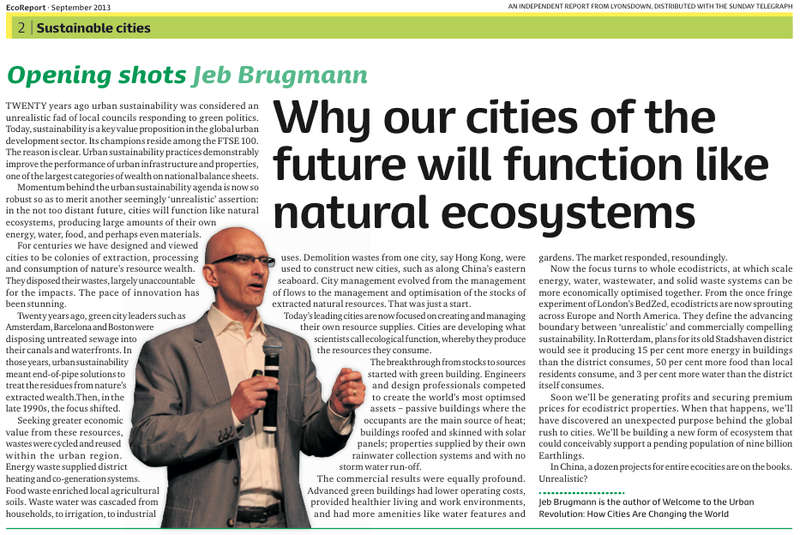 Jeb Brugmann was featured in the Sunday Telegraph’s Sustainable Cities EcoReport for September 2013. Click here to read the full publication. Climate change adaptation and natural disaster reduction is typically viewed as a cost that must be funded by governments and property owners. Since the costs of preventative measures offer no clear investment return, little is done until disaster strikes. In this paper, Jeb Brugmann presents an alternative strategy for disaster reduction in cities: establish a market for ‘resilience’ as a performance benefit of locations and properties, much as markets have been established in recent decades for ‘green’ and ‘livable’ locations. The findings of a recent collaboration between Ceres, ClimateWise, The Next Practice, the University of Cambridge Programme for Sustainability Leadership, and others will be available here soon. 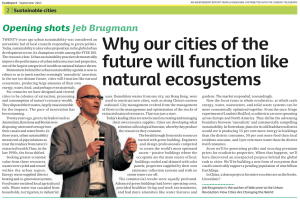 In this video Jeb Brugmann presents the opening address at the Canadian Green Building Council (CaGBC) 2013 National Conference in Vancouver, British Columbia. In his speech, Jeb presents the challenge of TNP’s new Thrive on Earth programme, and how we must prepare to support 9 billion people on this earth. Could it be possible to sustainably support the resource demands of 9 billion people by 2050? Solutions will be found in a fundamental re-conception of our cities as places and systems of resource production. Jeb Brugmann, Managing Partner outlines a roadmap for innovation in the this working paper. Corporate leaders from the disparate worlds of finance, energy, fast-moving consumers goods (FMCG) and communications came together for the first Shared Value network meeting in London. Hosted by TNP and our close collaborator C&E Advisory this was the first of a series of gatherings designed specifically to share best practice in the emerging field of shared value. We know from our work with a number of companies that new area’s of shared value practice generally have no road map or benefit of experienced wisdom. Knowing that work of this sort can sometimes be a lonely place, we hope this network will provide an opportunity to test, share and collaborate. To find out more contact Sarah McGeehan at sarahmcgeehan@thenextpractice.com. The Next Practice Ltd., established in 2004, is an international innovation management and new ventures development consultancy. We specialize in enterprise for social and environmental impact. Our end-to-end services support clients to conceive, specify, pilot, and enter the market with their ‘next practice’ products, programs, services, business lines, and investment programs. Copyright 2013 - The Next Practice Ltd.